October 10, 2018, Baku – Azerbaijan’s capital hosted the 35th meeting of the “Eurasia” Coordination Council, which brings together CIS countries’ national providers of air navigation services. The meeting was attended by over 90 participants from 15 countries, including general directors of national providers of air navigation services in the CIS countries - Azerbaijan, Russia, Kazakhstan, Belarus, Kyrgyzstan, Tajikistan, Uzbekistan, as well as representatives of international aviation organizations like ICAO, IATA, Interstate Aviation Committee, etc. On October 10, AZAL President Jahangir Asgarov made a welcome speech at the meeting. Later the meeting continued with speeches by Director of Azeraeronavigation Air Traffic Control Center Farkhan Guliyev and Chairman of the Eurasia CC - Director General of the Federal State Unitary Enterprise “State ATM Corporation” Igor Moiseenko. Given the need for growth in air traffic and the strategic geopolitical location of Eurasian countries, harmonization of air navigation support and long-term joint planning of the organization of airspace between these countries is important. The meeting heard the reports of representatives of “Eurasia” member states’ national providers of air navigation services on the state of the CIS countries’ air navigation systems and development plans. 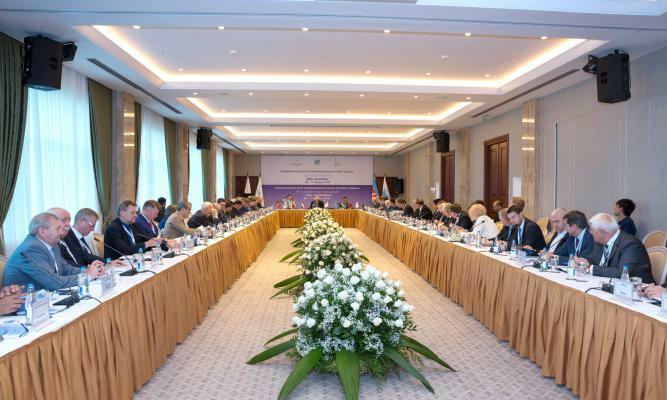 - harmonization of the national air traffic management systems of the countries participating in the “Eurasia” Council. Representatives of international organizations like ICAO, IATA and the Interstate Aviation Committee also made reports at the meeting. It should be noted that the "Eurasia" Coordination Council was established in 1999. Its founders are FSUE "State ATM Corporation", RSE "Kazaeronavigation" (Kazakhstan), "Azeraeronavigation" (Azerbaijan), SE "Belaeronavigation" (Belarus), SE "Kyrgyzaeronavigation" (Kyrgyzstan), SUE “Tajikaeronavigation” and “Uzaeronavigation” Center (Uzbekistan).